I am lucky enough to have a job where I can occasionally skip out for an afternoon and make up my time in the evening. I decided that today was one of those days as it was cool and sunny. It has been gray and windy the past few days and I’ve had good luck a few times when I was able to hunt the first sunny day after a few crappy days. Tina and I started out at a small area that we have seen birds at each time that we have hunted it this year. We have never gotten a bird here though. In fact the last time we hunted this spot, three of us moved 4 birds and didn’t put one in the bag. When we pulled in I could tell that the area had been hit fairly hard in the days since we had last hunted it. The grass on the trail was much more beat down by people driving in. We worked the trail out and bushwhacked through the clearcut on the way back and didn’t move a bird. Off to the second area. I marked this area “ Don’t Hunt “ as it is mostly older growth and we have only seen one bird there. I decided to give it a shot again though as it was on the way to the third area and the trails were easy walking for 15 yr old Marge. After about going 100 yards down the trail she locked up solid. I started to look around and just as I looked to the right into some saplings the grouse came up and with the shot the grouse came down. I’m always excited when one of the dogs has a nice point that produces a bird but I am even more so when one of the old timers can have it happen. We worked the trail for another 40 minutes but didn’t move another bird. After putting Marge back into her travel kennel I got out Fergie and we went for a stroll. Even though she is totally blind she still loves to get out and smell the air. We did a short walk and then returned to the truck. Our next spot was a MN Hunter Walking Trail. These trails are well publicized by the state so they aren’t any big secret but this one has decent habitat diversity and we have seen birds here before. The hunt started well with Tina going on point less than 100 yards from the truck and and easy straight away shot put the bird into the bag. The next bird was luckier as Tina had a good point on a corner and it broke down the side of the trail that I hadn’t gotten to yet and I didn’t even get off a shot. We had started to hunt an area of the trail system that I hadn’t been able to cover yet and I could hear Tina working off to the side in an area of thick pine trees. I was starting to get a bit impatient as she didn’t really seem to be working the type of cover that had been producing birds when her beeper collar indicated that she was on point. I made my way into the pine trees but couldn’t see where she was when I heard a flush and saw just a flicker of the bird. I still couldn’t see or hear Tina when I heard a second flush and was able to get off a snap shot. I couldn’t see if I had hit the bird or not but I heard a thud letting me know that I had connected. A third bird flushed but I passed on the shot as I wanted to make sure I had correctly marked down the bird. As I made my way to the bird I could see Tina holding her point downwind of where the birds had flushed. About 25 yards from the truck is an area where two of the trails come together and create a choke point and Tina started to get really birdy but I figured “ how could there be any this close to the truck “. I was about to find out as she locked on point and I moved up the trail to cut them off by the edge of the trail intersection. A flush and a hurried shot saw the bird fly off unharmed but the shot sent another bird up and this one wasn’t as lucky and became bird number four in the bag. There was still and good 90 minutes of daylight left and Tina was still showing good energy so I decided to take a look at the other trail that starts at the parking area. It started out by going through an area of younger growth but soon changed to older cover. The trail split and we took the fork to the right after a short time it hit and area of blow down and Tina started to get birdy again. She was a decent distance through the blowdown and off to my left when the beeper signaled point. I wasn’t too excited about making my way through all of the logs to get to where she was but she had been pretty good with her points as of late so I thought it would be worth it. As I started to approach her I was off her right side and could see that the cover was much thinner past where she was pointing. As I passed her I could see that it was actually the other fork of the trail and as I stepped onto the trail a bird got up from in front of her and I again missed and again I was lucky enough to have a second bird get up and even luckier when I was able to connect and drop it just a little distance up the trail to make for an easy retrieve for Tina. All five of our birds came from public land and four out of the five came from a well marked Hunter Walking Trail in the Grand Rapids, Mn area. The outlook for prairie chickens, sharp-tailed grouse, and gray (Hungarian) partridge is a mixed bag at best this season. In MONTANA, a very severe winter and heavy rains in the spring had a strong negative impact on upland birds in general. Those areas of the state where prospects for one or the other species are at least average are: Region 3: Huns improved from last year, close to average, same in Region 4 (north); Region 4 (south): sharptails average; Region 5: Huns improved, close to average; Region 7 (south): Huns above average. NORTH DAKOTA came into the breeding season following its third consecutive harsh winter, and spring 2011 was unusually wet. With a sharptail breeding population that’s 30% lower than last year, that spells lower bird numbers, for both species. More rain than normal also means taller cover, which in turn means that the birds will be harder to find. It all adds up to lower numbers for both sharps and huns, although there will be localized pockets with decent hunting. Especially for nonresidents planning a trip to the western part of the state (the best region for huns and sharptails), there’s an additional problem: the state’s oil boom means that lodging is hard to come by anywhere west of Bismarck. If you haven’t secured reservations, don’t count on finding a place to stay. Although the oil industry has provided a significant economic shot in the arm, there are concerns about the impact of the oil fields on sharptails. And North Dakota is losing significant amounts of both CRP and PLOTS (Private Lands Open To Sportsmen) acres because of high grain prices. Things look somewhat better to the south. With an estimated 57,000 birds bagged, SOUTH DAKOTA experienced its best prairie grouse harvest (sharptails and chickens combined) since 2001. 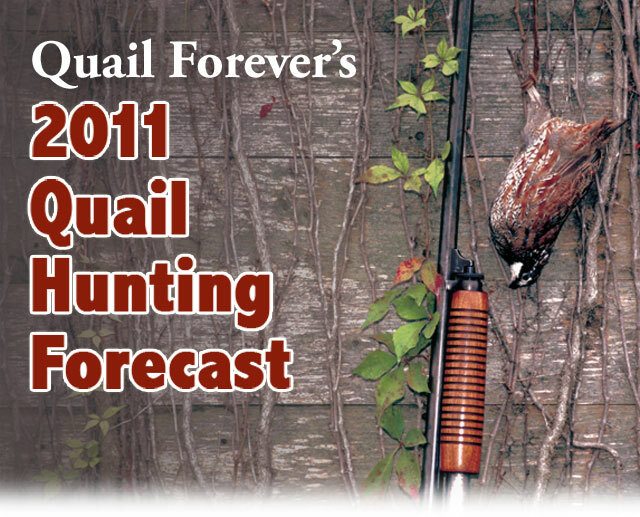 That was a significant increase over the 39,000 birds hunters took in 2009. This year, spring lek counts were down somewhat for sharptails, but up for chickens. Although there was some heavy rain during the nesting season, overall conditions were relatively favorable. Rains do help the grass, which puts the habitat in good shape for the coming season. Top grouse counties are Stanley, Dewey, Lyman, and Hughes in the central part of the state, and those immediately adjacent to them. The South Dakota website includes an excellent map showing grouse densities. We decided to just drive while the Garmin pointed us to where it said that there were some clear cuts to hunt. ( I purchased the maps and data files from http://www.northwindenterprises.us/habitat-maps-listing.html ). The first spot Tony decided to hunt it with his two dogs. He wanted them to get a chance to focus on birds and not other hunters and dogs. He ended up taking two birds from this spot. The first trail that Mark and I tried ended at a beaver pond so we made a quick trip farther up the road to another trail. After about 5 minutes on this trail Tina got birdy. Two birds got up from the left side of the trails. Mark shot left and I shot right. Neither one of us connected. We worked the trail a bit longer and then made our way back to meet up with Tony. During the overlap of the ruffed grouse and woodcock seasons, upland hunters get a unique opportunity to hunt both game birds at the same time. Here are some hunting tips for grouse and woodcock and how you can prepare yourself for a mixed-bag hunt. Grouse and woodcock prefer young woods in regrowth — what is known as successional habitat — to woods that are middle age or approaching senior citizenship. Successional habitats are thick with aspens, birches, maples, hemlock, spruce and brushy scrub. During the early season it’s the feeding areas that hunters need to key on. Opening a grouse crop reveals they aren’t picky, but during the fall they are likely feasting mainly on berries and fruit such as high bush cranberry, feral apples, and wild grapes. Woodcock, on the other hand, feed almost exclusively on earthworms in the soft soil of young clearcuts, abandoned farmland and areas near or in wetlands. The overlap of areas that appeal to both grouse and woodcock — or what I call combo cover — is so prevalent that the chances of encountering both species in one hunt is a forgone conclusion. With that said, grouse and woodcock are “where you find them.” I have flushed grouse from the middle of open fields and woodcock on dry hillsides under towering white pines. You need to be ready for anything. It’s well known that a bird hunter can put a fair amount of ballast in his game pouch hunting ruffed grouse without a dog. But that hunter wont be spicing up many grouse dinners with woodcock appetizers. 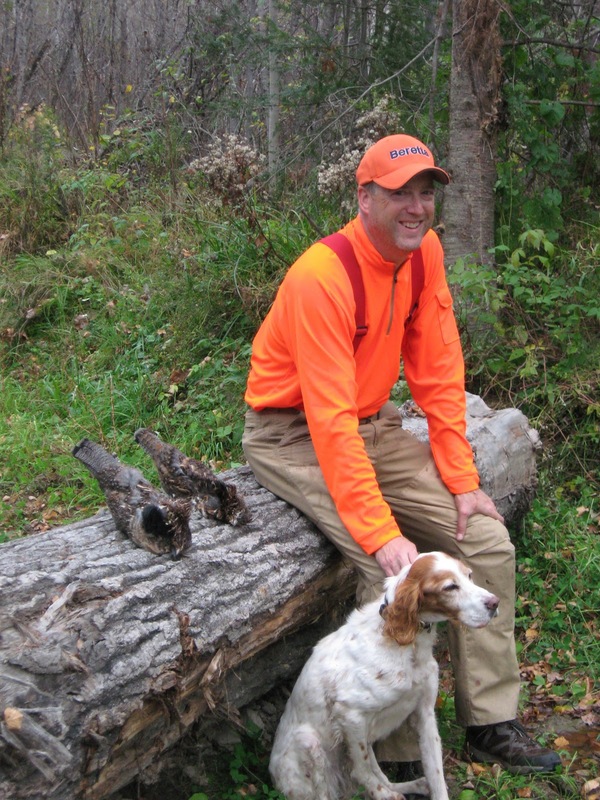 Like many grouse hunters I started out without a dog. I learned where they spent early mornings and mid days and where they went to roost in late afternoon –and, most important, the escape routes they used in a particular cover. On those dog-less grouse hunts I would occasionally kick up a woodcock by nearly stepping on them. One woodcock means there are likely more in the general area and you can wander around aimlessly, or even do a grid pattern and move birds. Author Brad Eden with his springer spaniel Jake and a mixed bag of grouse and woodcock. Photo by Brad Eden. But for mixed-bag grouse and woodcock hunting at its best, a close-working flushing dog or a staunch pointing dog is the ticket in the thicket. I can tell when my flushing spaniel is tracking woodcock scent. Woodcock bop and weave around the forest floor like a wind up toy while feeding or moving about a cover. A flushing dog will twist and turn itself into a pretzel when on that ground scent. When I see this I get ready because a flush is imminent. Not all dogs will share exactly the same body language, but you can become good at reading your dog. My current springer spaniel has a unique behavior that gives me an extra second or two to prepare for the flush. When approaching the feathered source of that scent trail he will suddenly stop and look up into the air to watch the bird flush — as it inevitably does. Although under most hunting situations a hard flush is expected of a spaniel, I have come to rather appreciate this unique “heads up” for woodcock. Pointing dogs and woodcock go together like birds and flying. The woodcock often sits patiently under the pointing dog’s nose, allowing ample opportunity for the gunner to approach, look around for shooting lanes, and close in for the flush. That’s the perfect scenario and happens enough to be typical. But woodcock aren’t slouches and will sometimes walk out from a point and flush wild like a grouse. Be prepared to be surprised. We hit the turnaround with only moving one bird. This same weekend last year we were moving 20+ birds in the same amount of time on the same trail. We started to hear some rumbling off in the distance. We picked up the pace on the way back to the trucks and didn’t move any birds. We made it to the vehicles just as the rain started. After lunch and rest at a bar/grill in Bigfork we started to work to the west and south. We ended up just north of Deer River at an area that I had tried a few times in the past. With three hunters and three dogs it was clear that we weren’t going to sneak up on any birds. A short way down the trail Tina started to get birdy and locked up. I swung up the trail and moved in towards her. She stayed staunch. I could see her eyes looking just off to her left and I moved that way. Up came a woodcock and I decided to try take it as a reward for her hard work. I missed, but saw where it landed and released Tina and made our way in that direction. She made another nice point and I didn’t miss this time. We made it to an area with some younger pine trees and Tina started to work off the trail so I decided to bushwhack it a bit. Tina was working to the trail and then off to my side. She started to slow and was getting ready to point when I heard a flush at the same time Mark called out. The grouse came my way and I was able to connect on a going away shot. Tina made a nice retrieve. We ended up back at the truck without moving any more birds. We decided a totally new area ( new to us anyway ) was in order for the following day. On the way back Tina either bit her tongue or it got poked by a stick and was bleeding all over her front. She looked a mess but I think was mostly tired. After riding home and getting washed up in the lake she was all set for her dinner and some sleep before the next day. Our friend Mark arrived after lunch and we headed out for the afternoon. We hit the trail at around three. It was Mark’s first time out hunting this year. We were hunting the walking trail that I had hunted a few times earlier. We had been going about 15 minutes when Tina gave me a solid point. I was able to connect on a nice crossing shot and put the bird in the bag. It was still very dry and I was happy to take the bird over a point. We went down a branch of the trail that I hadn’t been down before and Tina started to get birdy again. We had a few non-productive points so I wasn’t too sure about the point but when her tail stopped wagging I got more confident. Mark moved in and was able to connect on his first bird of the season. A short time later she was on point again. I made a good sized loop to try to pin the bird. I kept moving closer and closer but no flush. I made it to within about five feet before the woodcock flushed. I took the bird on the flush. I don’t normally shot woodcock but I wanted to reward Tina for her hard work. It was staying in the mid-70’s so we started back to the truck. Tina was still working hard as we made our way back and made a wide cast along a small area of blow down. As she hit the far side of the area she locked up solid. I wasn’t too excited about having to make my way through the area as the walking was tough. I went straight towards her as she appeared to be looking right at me. I kept waiting for her head to move or for her to break point but she stayed solid and the first thing to move was the grouse. 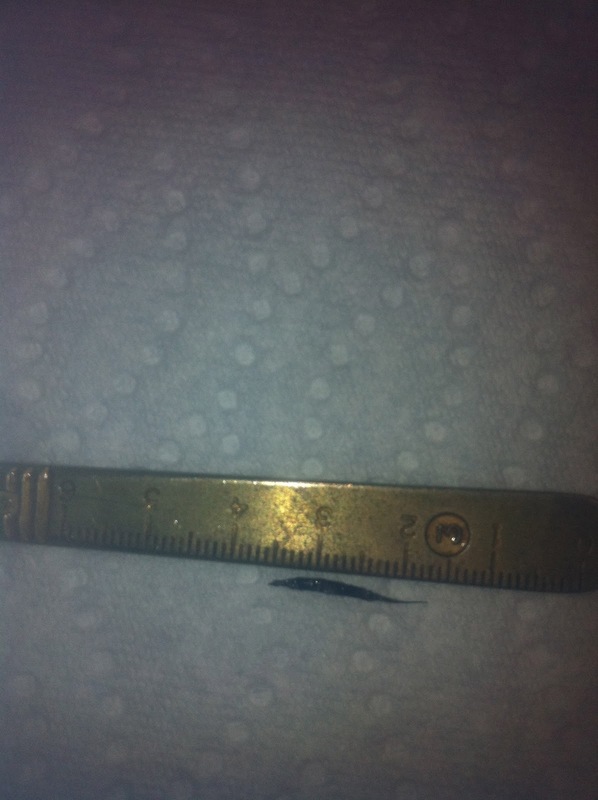 It took two shots but I was able to bring it down. We ended up taking three grouse and a woodcock in about 90 minutes hunting on a less than optimal day. I was very pleased with Tina’s work and happy that we were able to connect on all the birds that we shot at. It doesn’t always work that way but it did. Another new area was on tap for today. We made it to the woods at 10 am and it was already 60 degrees. The Garmin said to take a forest road right off of hwy 2 and it wasn’t too bad until we passed the newest clear cut area where they were still working. We went another mile down the road to the clear cut that we had marked. It looked very promising. Tina, as usual, was the first dog out of the truck. She worked the area well but didn’t get too birdy. The trails along the clear cut ended up being rather short so it was back to the truck and another mile down the forest road that was now getting more narrow. I wouldn’t want to be on it most years as it looked like it would normally be very muddy. Spot number two was a narrow trail with about a 10 year old cut on one side and some lower areas along the other. About 15 minutes down the trail and Tina had a nice solid point and I was able to take it on a straight away flush. The trail only lasted another 5 - 10 minutes. On the way back we were able to move the same Woodcock three times. Spot number three was six more miles down the forest road and I was getting more nervous about driving down it. Luckily I have been practicing my Rally Driving skills on the Mac at home. We made to the spot ok and I put Marge down for her workout. The cover was a bit older than what I prefer but I was hoping the grouse might be trying to stay cool in the shade. Marge did get birdy once but we didn’t produce a bird. Back at the truck it was Fergie’s turn to get some time on the ground. We got a nice walk in and checked out another trail that was in the area. She got in some good sniffing but not bird action. We pulled the plug as it was over 70 degrees and it was time to get back to the cabin and start to work. It was a decent hunt and fun to get back into some areas that I don’t think I’d normally be able to get back to. Saturday night was a long night as the dogs had drank so much water during the day that they kept having to go outside. They woke me up at 11:30, 12:45, 1:30, and 4:30. After the 4:30 wake up I put their training collars on them and they stayed quite. Too quite it turned out as I ended up sleeping until 9 am. That ruled out the longer drive to try some new areas that I had mapped out as it was already starting to get warm out. so I decided to retry some of the areas from the day before to see if they still looked good. The first spot that we went to was the walking trail area. Tina and I started by walking a different section of the trail system. After 30 minutes she hadn’t really gotten birdy at all we turned around and headed back to the section that we walked on Saturday. Within 10 minutes she locked up solid and I was able to connect on a nice crossing shot. We walked a while longer and didn’t move any other birds. Next it was Marge’s turn to see if the forest road with the older growth would produce another bird. We worked the trail a fair amount and while she did get a little birdy in a few spots we didn’t have any success actually moving one. After getting back to the truck I got out Fergie and took her for a walk. She can’t see but she still loves getting out in the woods and sniffing the air. Tina and I then took a chance on the first spot that we had hunted yesterday. The temperature was over 70 so it was a good last spot to try. We went down the trail next to the clear cut and it still looked promising but it was just so dry it was hard to know if the scenting was decent at all. We ended up going through the new growth to get back to the truck and she did make a nice point but it was so thick I couldn’t get into a good shooting position when I did flush the grouse. Even though we cut the day short we did put one bird in the bag, confirmed that two spots were still a good bet, and ruled out another. Years ago, I had the opportunity to bird hunt in Mexico when I was the Senior Editor at Petersen’s Hunting Magazine. I thought I had died and gone to bird hunting heaven. Ducks, geese, quail and dove in virtually unbelievable numbers. It not only made for some great stories in the magazine, but was an experience that I thought would be impossible to rival. Guess what? I was wrong! Because now, I’ve discovered the Light Goose Conservation Order (LGCO) right here in the U.S. For those not familiar with the LGCO, it is a fancy name for having the opportunity to hunt for late-season light geese that are migrating back up from Texas and Mexico to their nesting grounds in Canada. And best of all… no plugs are required in your shotgun. 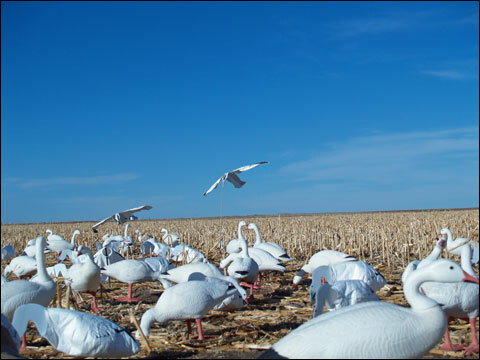 You can use large decoy spreads with electronic calls, and there are no daily bag or possession limits on the number of snows that you can harvest. Not only is it a lot cheaper and safer than traveling to Mexico, chances are excellent that regardless of where you live and hunt, there are huge migrating flights of snow geese within a several hour drive of you. A quick check on www.HuntNFishRegs.com will give you access to all hunting and fishing regulations for every state in the U.S. Simply go to the waterfowl regs for your state and see if you too have a late season snow goose hunt. You are likely to be surprised at how many states have very liberal season dates and are encouraging hunters to get out in the field and put a bunch of snow geese down for a dirt nap! The decoy spreads worked exceptionally well, bringing in the show geese very low. So why are so many states declaring a late season war on snows, blues and Ross’s geese? Simple and best answer is, there are simply way too many millions of them and they are destroying nesting and wetlands areas in Canada. Go back historically, and a lot of the states actually banned snow goose hunting back in 1916 because of low population numbers. This ban by many states stayed in place until 1975 when it was deemed that the population numbers were again stable and that hunting could start up again. Unfortunately for the wildlife experts, the white geese population took off and exploded. Today it is estimated that there are upwards of 25 million of these white geese, and they are literally destroying their nesting areas, and eating themselves out of house and home. Realizing that the problem was growing like an upside-down pyramid, the LGCO was initiated in 1999, with the idea of making a late-season, unlimited harvest on these light geese in an attempt to reduce their numbers by at least 50 percent. For the hunter, with seasons that often run from September until the end of May, it’s been a bonanza/shoot fest for those who make the effort to chase and outsmart these wily birds. On the downside, even with the late-season/unlimited hunts, many wildlife experts are saying that all the hunting efforts have and are doing very little to put a dent in the overall light goose populations. And while other methods… including the destruction of nests is being considered for population control, experts say that option is extremely expensive and controversial.